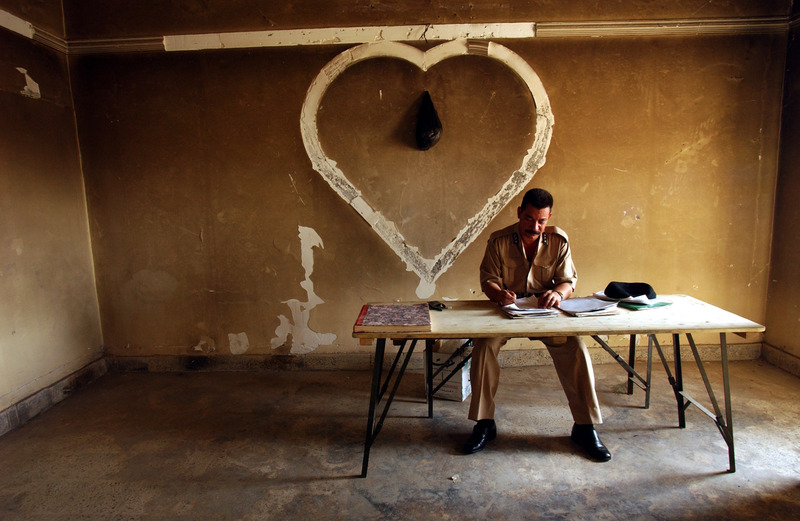 An Iraqi police clerk fills out a report in the former office of the head of the Republic Party of Basra in one of the old Bath Party Headquarters-turned-police station in Old Basra, Iraq, May 26, 2003. As part of the philospphy of the Royal MIlitary Police, the soldiers are teaching Iraqi Policemen to fill out reports for all everything that happens in their jurisdiction, in an effort to eventually pass all responsibility on to the Iraqis. There is rising speculation as to whether the British manner of patrolling Basra has been more successful in governing the city in contrast to the American's more stand-off-ish approach to governing Bagdad. Unlike the Americans in Bagdad, the British often patrol Basra with no body armour and no helmets, and sometimes go out without their automatic weapons.